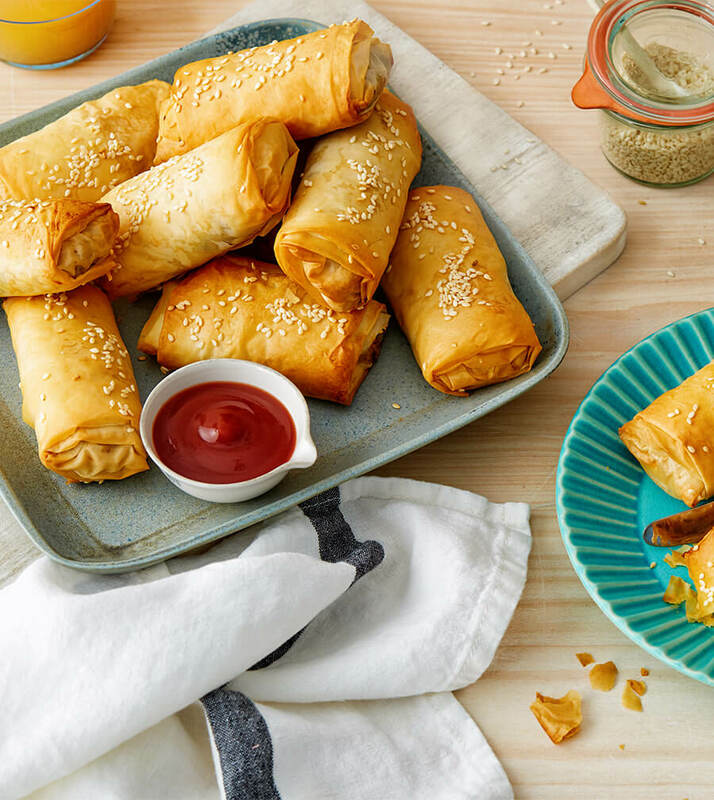 Remove the filo pastry from the freezer at least 2 hours before you need it. Keep it unopened at room temperature on the bench. Heat oil in a large frying pan over medium-high heat. Add leek. Cook for 3 minutes or until softened. Add garlic and cook for 1 minute. Add chicken. Cook, stirring occasionally for 5 to 6 minutes or until just cooked through. Add mushrooms and sage. Cook for 2 minutes, or until mushrooms are tender. Add stock. Cook, stirring, for 2 to 3 minutes or until boiled and thickened. Remove from heat. Place a sheet of filo onto a flat surface. Brush with melted butter. Fold in half, short end to short end. Spoon ⅓ cup of chicken mix onto a short edge, leaving a 6 cm border on each side. Fold borders over filling and roll, enclosing filling. Transfer to prepared tray. Repeat with remaining pastry and filling to make 8 rolls. Brush rolls with melted butter and sprinkle with sesame seeds. Bake for 20 minutes or until golden and crisp. Filos will keep in the fridge for up to 3 days or in the freezer for up to 1 month. To freeze, place the filos in a ziplock bag. Store them carefully in the freezer to avoid crushing the pastry. To reheat, defrost in the fridge overnight and then place in a moderate oven for 10-15 minutes until heated through.